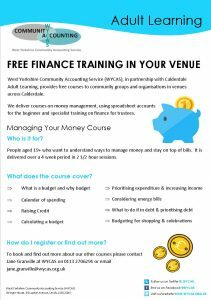 Managing Your Money – suitable for individuals who need to learn how to budget and stay on top of bills – we can take up to 12 people per course and deliver to a minimum of 5. Spreadsheet Accounts for Beginners – suitable for people who want to learn how to set up bookkeeping on a spreadsheet. 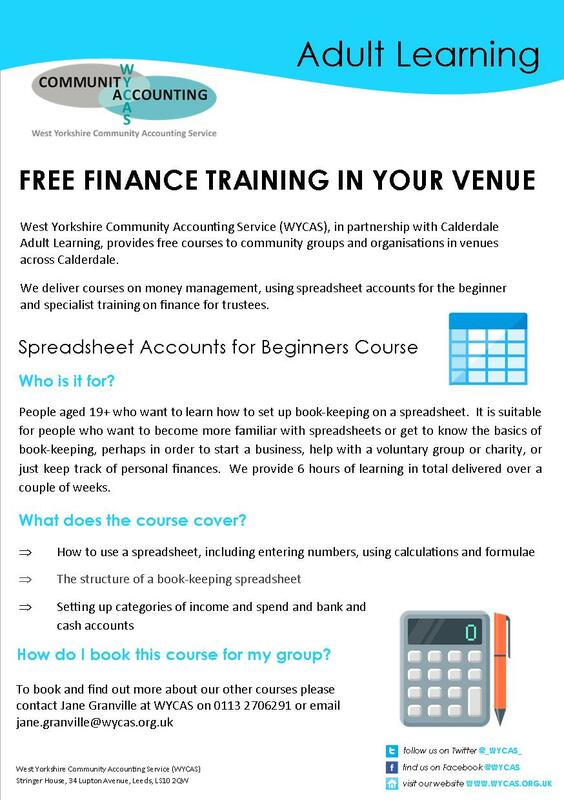 Learners may want to do the course for themselves, they may want to set up a small business or understand spreadsheet accounts to help with charity or voluntary group work. This has a maximum of 8 people as laptops are required – we supply the laptops! For further information about our courses please click on the images below (opens PDF). If you would like to host a course and can recruit learners we would be pleased to discuss dates and times. We are now booking in dates for the Spring and Summer 2018 terms and can adapt the hours of the courses to suit local needs. 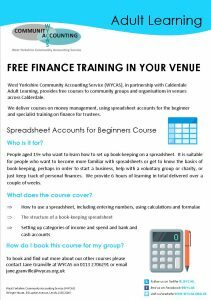 If you have any questions or would like to book free finance training in your venue please contact Jane Granville by email or telephone: 0113 270 6291. We look forward to hearing from you.